Tatsuo Shimabuku, the founder of isshin-ryu karate, was a small, gentle individual approximately five feet tall and about 125 pounds. He was an easy going person, with a good sense of humor. Shimabuku was not a disciplinarian, and never forced anyone to follow or change to his system. What he did do was set the example for his students. He not only taught kata, he lived it. He lived in his Agena Village dojo (training hall) from the late 1950's until his death on May 30, 1975. His living space covered about 50 square feet. Here he ate, watched TV, drank and slept. His dojo was always open, with formal classes conducted weekdays from 7:00 until 9:00 p.m. Students who came early in the morning were asked not to kiai (shout) or hit the makiwara (punching board) until later so as not to disturb the neighbors. The workout area was a concrete floor about 35 feet by 50 feet, surrounded by a concrete block wall over six feet tall. Students bowed when entering the dojo, removed their shoes, and went to the dressing area to change into their gi (uniforms). Students would bow and greet instructors, seniors or juniors as they passed them. Prior to the formal class, students would work out on their own or with a partner, limbering up, striking makiwara or heavy bags, practicing kata (prearranged fighting forms), and sparring. At the correct time, the senior students (dai sempai) would call the students to line up facing him according to their grade, with the senior person to the right. Shimabuku, or the dai sempai, would have the students face the Buddhist altar--where a picture of the isshin-ryu megami (goddess) was placed along with the pictures of Shimabuku's karate teachers--and bow, then face him and bow. They would run around the dojo for five minutes and go through the exercise charts for the upper and lower body. There were 15 upper and 15 lower exercises, which included striking and blocking (upper exercises), and kicking, kneeing and limbering (lower exercises). As a general rule, students performed ten repetitions of each exercise. 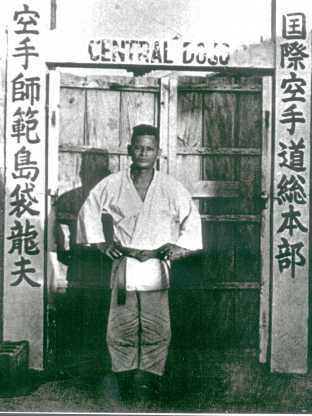 Shimabuku in front of Agena dojo. After the basics, students practiced forearm conditioning (kotekitai). There were three sets of these exercises. In the first exercise, partners faced each other while standing in seisan dachi (basic stance). The attacker punched at his opponent's chest, and the defender chopped down. Thus, the attacker developed his punch and conditioned his forearm, while the defender developed his chop and conditioned the edge of his hand. In the second exercise, the attacker threw a vertical punch at the defender's chest. The defender used an outside forearm block to deflect the blow and simultaneously reached across with a knife-hand inside block, catching the attacker's wrist and pilling it off to the side. The defender followed with a chop to his opponent's forearm. The exercise developed two hard techniques (the first punch and block) and two soft techniques (the second block and strike). The third kotekitai exercise incorporated breathing techniques. Both opponents faced each other in sanchin stance and locked arms, palms facing up. One began to twist his hand, sweeping his opponent's hand down, creating an opening to strike or punch. His opponent allowed him to go only so far, then suddenly reversed the action, sweeping the attacker's arm back and beyond where it started. This was the Okinawan equivalent of the Chinese exercise "pushing hands". Breath control was used to increase power, the student exhaling as force was needed. The purpose of the exercise was to teach cultivation of ki (inner energy). Shimabuku called ki by its Okinawan term, chinkuchi, which means sinew, bone and energy. He perfected his chinkuchi, which made his techniques exceptionally strong. "You can't hold (chinkuchi) or keep it; it is brought out when and where you need it," Shimabuku said. Shimabuku took what he believed were the best elements of shorin-ryu and goju-ryu karate to make isshin-ryu. But what did he take, and why? And what did he create? Shimabuku was always an innovator and inventor. At one time, mud was used to bind the tiles to the roofs in Chan village, but Shimabuku found a way to do it without mud, which the other villagers followed. He was a pioneer in the use of protective gear in free fighting. Other karate teachers disagreed with its use, saying it detracted from the true spirit of karate, but today, safety equipment is widely accepted. Shimabuku had many questions for his teachers, which they never answered to his satisfaction. It was only after a vision he thought he was divinely inspired that he publicly announced his new system. He felt if he could make a system stronger, shouldn't he do it? If he could make it faster, was it not correct to modify the techniques? He did not believe in change just to be different, but because it served a purpose. For over 30 years, Shimabuku experimented with different methods of holding the fist. He found that if you placed the thumb on top of the fist, instead of on the side, the wrist became stronger. He therefore settled on this position for the Isshin-ryu vertical fist. Shimabuku tried different blocks by using the bone area of the forearm, which was the classical method, and by using the muscle portion, which is the method used when breaking boards with the forearm in demonstrations. He felt the muscle block was superior because it took less time to initiate, and thus generated more power. A person without any training should be able to strike a two-by-two with full power and receive no more than a welt if he uses the muscle of the forearm instead of the bone. 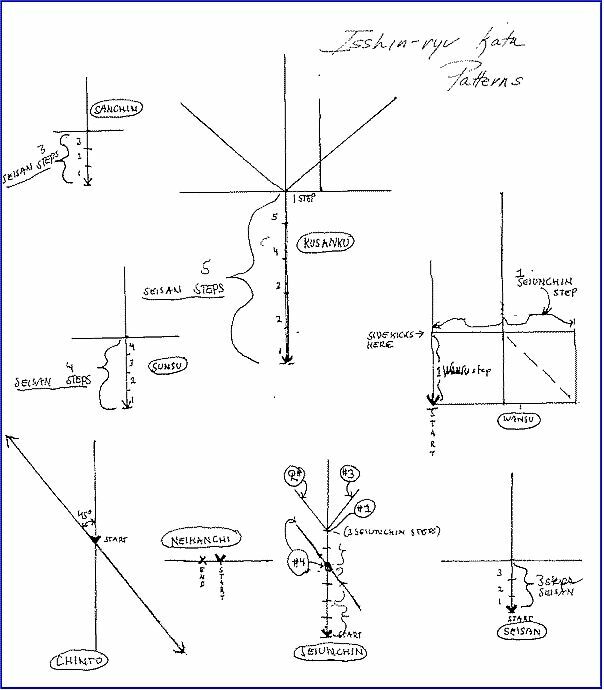 Shimabuku settled on this method as the basic blocking procedure for Isshin-ryu. The punch or thrust, whether with fist, spear hand or palm, is used a good percentage of the time in Okinawan karate. There are only two times you can't use your arms in a confrontation: If your hands are tied behind your back, or if you're climbing up or over something. That is why punches are very important. Shimabuku didn't understand why most karateka (karate practioners) used a twist punch, corkscrewing their arm out at their opponent. If the opponent moved in on you, Shimabuku insisted, your fist would never fully turn to strike correctly. He also noticed that when punching to a target higher then shoulder level, the lower fingers had a tendency to hit first instead of the top two knuckles. Another thing Shimabuku observed was that, when throwing multiple punches, it took a lot of training and effort to throw twist-type punches. When not twisting, speed was greater and more punches could be thrown in less time, using less energy. But the twist punch, his instructors told him, was like a bullet which, twisting out of the barrel of a gun, generated better accuracy and power. Shimabuku disagreed with the twist punch theory, however. In his opinion, faster was better--as long as there was power. He learned from shorin-ryu that punching from the hip, using a rising punch and hip rotation, gave one a stronger punch. From goju-ryu, he found that by proper breathing he could bring out even greater energy. Hence, the basic isshin-ryu punching method included punching from the hip without a twist, but use a rising punch, and utilizing hip rotation and proper breathing. Stance is the foundation of all Okinawan karate. Because Okinawa is a coral island with very hilly terrain, and is covered with tropical vegetation surrounded by sandy or coral beaches, fighting methods became more static than systems from other countries, which had plains or open areas which to move about freely. 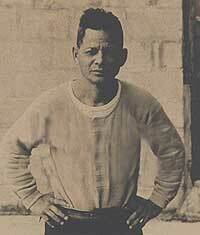 Okinawans would stand in rice patties and await opponents to come in them. They even had one foot out of the mud prepared to kick. Those on rice patty dykes would have to move sideways in stances like naihanchi , while others on the numerous stone bridges in Okinawa could move around more freely and use techniques like flying jump kicks. Persons caught on the beaches would have to learn how to get into stable stances on slippery coral, then change stances once they moved to the sandy areas. On their small boats, fisherman learned to utilize completely immobile stances. Naha-te forerunner to goju and uechi-ryu karate, put its emphasis on the sanchin stance, where one can grip the floor using inside tension. This stance is excellent for infighting and against multiple attackers. Shuri-te, another early Okinawan art, emphasized the forward stance (zenkutsu), which gave power to the front of the body, making it an excellent one-on-one stance. Shimabuku wanted a little of both positions for isshin-ryu's basic stance. He created what he called seisan stance, whereby one stands in a high, upright stance similar to naha-te, but with the knees bent and even with the toes, and without any inward tension. This allows greater spring and lowers the center of the body. Weight was evenly distributed on both legs, allowing kicks with either leg in all directions. To get the same protection and strength of shuri-te, all one had to do was face his opponent diagonally, exposing less body mass, but still allowing punching and kicking power in any direction. Shimabuku's new seisan stance allowed flexibility never before enjoyed. He could move into any other stance with minimum adjustment. For sanchin, he would just turn the toes in and grip the floor by exerting inward tension. To move into the seiunchin stance, all one had to do was turn the rear foot to a 90 degree angle and drop the body down. movement in any direction was now possible, and kicking with either foot could be accomplished without leaning or transferring weight, which telegraphs the movement. From goju-ryu, Shimabuku took the seiunchin and sanchin kata and incorporated them into his new system. He also took the code of karate, which came from the Chinese martial arts book Bubishi. It was the guiding force for most of Shimabuku's philosophy on isshin-ryu. From shorin-ryu, he took seisan, naihanchi, wansu, chinto, and kusanku. Most of the basic isshin-ryu exercises are also derived from shorin-ryu, along with a larger variety of kicks not found in naha-te. Shimabuku had already learned a number of weapon forms and added two of his own weapons kata to isshin-ryu: sai and kusanku sai. Shimabuku also created the sunsu kata, considered the easiest of all isshin-ryu forms to perform because most of its techniques have already been taught in basics or other kata. Its novelty lies in its return to the basics. Shimabuku never taught advanced techniques, only basic moves made to look like they were advanced. What made Shimabuku so controversial? For one, he changed the name of the shorin-ryu system to isshin-ryu. Second, he discarded the traditional twist punch in favor of the faster, rising punch. Third, he had a contract to teach American servicemen and most of his students were soon Americans. Word got out that he designed his style for Americans. Fourth, he used protective gear, which many said made karate into a sport. Fifth, since many Americans were taking isshin-ryu, Shimabuku was holding demonstrations on and off base and was getting tremendous publicity. Sixth, he broke away from the Okinawan Karate Association in 1960, making himself and independent and therefore a maverick. Because he left the association, many of his Okinawan students broke away from him because they did not want to lose their identity with a recognized system (shorin-ryu). But perhaps the most controversial thing Shimabuku did, and one which brought discord from his Okinawan students causing many of them to leave isshin-ryu was the double standard he established for promoting Americans. 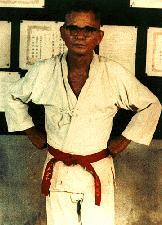 Shimabuku first gave green and black belts to Americans in the late 1950's. It took six or seven months to make green belt, and a couple more to make black. He didn't give a certificate to Americans until they left Okinawa. At first he gave low grades, but the students persisted until he began to give high grades for a minimum time. One American was given and eighth dan (black belt rank) after only two and a half years in isshin-ryu, while another made seventh dan after one and a half years. To justify such ranks, Shimabuku would say "You'll rate it in 15 or 20 years." He gave higher grades because he thought most Americans would not be returning to Okinawa. According to Kenji Kaneshiro, Shimabuku's senior student, "Americans would beat the smaller Okinawans in free fighting, then they would push Shimabuku for higher grades than the Okinawans. When they came back to the States, they would proclaim that they were number one or the best of Shimabuku's students. Some would claim to be champions of Okinawan karate. They couldn't even say karate correctly, so how could they teach it correctly? Diplomas have nothing to do with karate." Nevertheless, when the Americans returned to the United States from Okinawa, most did not wait 15 or 20 years, but proclaimed their high grades immediately. Genyu Shigema, another of Shimabuku's senior students, said "Shimabuku had me teach the first Americans because I worked for the marine Corps and could speak English. I was one of their instructors, and now they all outrank me!" Shimabuku finally sent a letter to each of his students stating that "all dan awarded prior to June 10, 1961, are considered invalid." Most Americans ignored this memorandum, however, and kept wearing their higher ranks. There was not only controversy about the high ranks Shimabuku gave to his American students, but how he also received his own tenth dan. 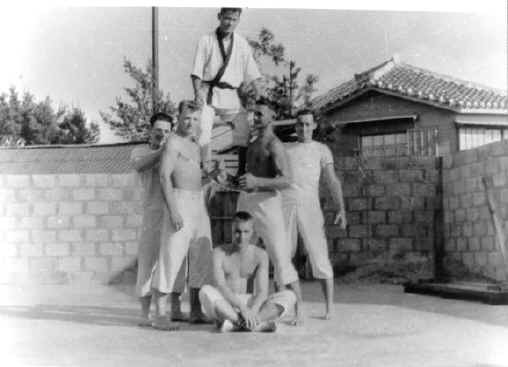 Steve Armstrong, one of Shimabuku's American students, purchased a red belt and gave it to Shimabuku in 1960, telling him he deserved it because he was the founder of isshin-ryu. Shimabuku then reportedly took off his red and white belt and gave it to Harold Mitchum, who was the first American to be promoted to eighth dan. Shimabuku was an innovator who searched for ways to improve karate techniques. Although many instructors before him had their own ideas and also made changes in techniques, Shimabuku was even too radical for them. Today, several branches of shorin-ryu use the muscle block in some techniques as opposed to bone-on-bone forearm block. Some now also use the vertical punch when punching to the face. Shimabuku's problem was that he was born too soon. He was in the wrong place at the wrong time. But because Isshin-ryu now has the largest following of practioners of Okinawan karate in the United Stated, he has the last laugh. The following story sums up the true spirit of isshin-ryu. Shimabuku and a group of students were sitting around a table drinking at the dojo after a workout. There were many bottles of sake, soda and beer of various sizes on the table. Shimabuku asked the students "Which is the best bottle?" Those who were drinking beer stated the beer bottles, others picked the largest bottles, and some chose the smaller bottles. Shimabuku said all the bottles were good. All of them served a purpose: to hold what they were intended to, "There is no best bottle," he said. Each individual must find what he is looking for in a martial art, what is right for him. If he should choose Isshin-ryu, the "one-heart way," the offspring of shorin-ryu and goju-ryu, all the better. About the Author: Arcenio J. Advincula studied for 17 years on Okinawa directly under the late Tatsuo Shimabuku--longer than any other American. He currently runs a martial arts school in Oceanside, California.